"This is an easy recipe for making a coffee flavored liqueur. This can be used in any recipe that calls for coffee flavored liqueur, as a cordial alone, mixed with milk or more vodka, etc." In a 3 quart saucepan over medium heat, combine the sugar and water. Bring to a boil, reduce heat, and simmer for 10 minutes. Remove from heat, stir in instant coffee, and allow to cool. When cool, stir in vanilla extract and vodka. Pour into clean bottles. Close bottles tightly, and store in a cool dark place. This recipe is just FABULOUS...I have tried many kahlua/coffee liqueur recipes and this one is by far the BEST!!!!! 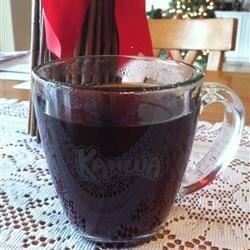 The best recipe for kahlua I've tried. The coffee flavor comes out very bold and smooth. Much richer than store bought. This recipe is fantastic! My daughter bought a bottle of kahlua not knowing I made this recipe for the holidays. Our family agreed this recipe much better than store boughten.